There once was a time in this country when everyone was expected to be at church regardless of whether they believed in God, Jesus and the Bible or not. Its much better today that the expectation is only on those who actually have a faith. Of course, the church has an open welcome for everyone, no matter who you are, where you're from, what you believe or what you've done (at least that's certainly true at WCF). But its no surprise that most non-believers can't see the point of church. What is surprising though is how many believers can't see the relevance of church for themselves. Are they at fault? Is the Church at fault? 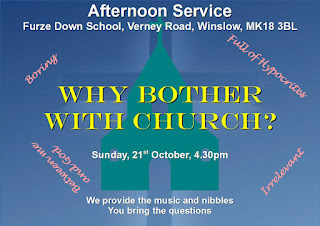 This Sunday afternoon, (21st Oct at 4.30pm) we'll be thinking about the question "Why bother with Church?" Its open to all whether your mind on the matter is open, closed, or somewhere in between. I don't know whether this question has ever occurred to you or not, but it is something that Ariana Grande has given some thought to. 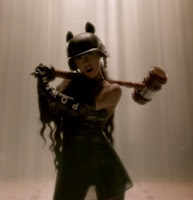 Ariana Grande is an incredibly successful popstar and, over the summer, she released "God is a Woman". Three minutes and 17 seconds of pop magic at about 75 bpm, the tune is catchy, but is the theology sound? 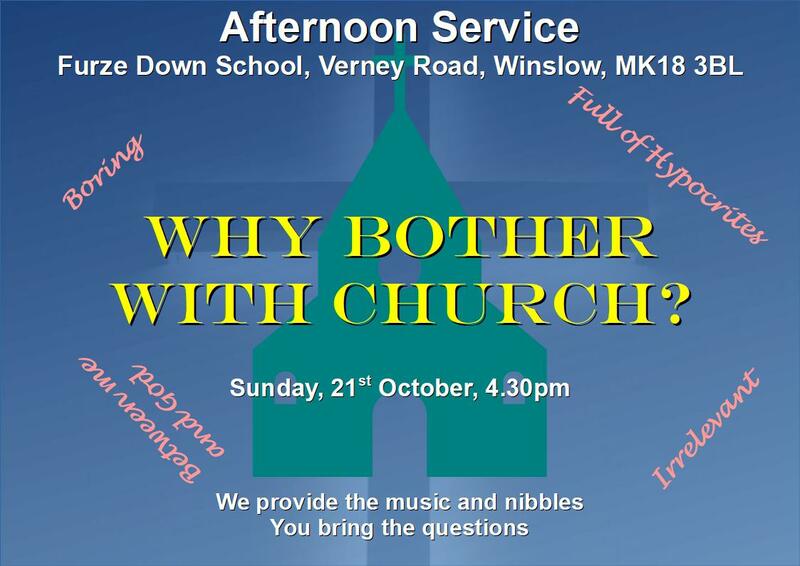 On Sunday 23rd September at 4.30pm Winslow Christian Fellowship will be launching their first afternoon service. Meeting in Furze Down School (their usual meeting place) there will be singing, there will be an informal cafe style seating arrangement and there will be nibbles! The question at the heart of the service will be Is God a Woman? Following a short talk there will be an opportunity for questions, so come prepared to engage and we'll see what happens. Here's a song that's new to WCF. Lets see if we make it part of our repertoire. O Lord, such love, I was as far from You as I could be. But Jesus' blood has cancelled every one. O Lord, such grace to qualify me as Your own. A hymn of praise to Almighty God, hallelujah! My life is hidden now with Christ in God. The old has gone and the new has come, hallelujah! O Lord, such joy to know that You delight in me. Many are the things that You have planned. All that we cannot earn, but is a gift of love. When the perishable has been clothed with the imperishable, and the mortal with immortality, then the saying that is written will come true: "Death has been swallowed up in victory,"
Just to be clear, this Sunday (4th March 2018) Winslow Christian Fellowship is back in Furze Down School at 10:30am. Our visit to the Fremantle last week was a one off! This Sunday we're meeting somewhere else! This Sunday (25th Feb) our service will be taking place at Sir Thomas Fremantle School on the Buckingham Road. The service will take place at the usual time, 10:30am. I'm the husband of one wife, father of three children and pastor of one church in Winslow, Buckinghamshire. I like to make music and pizzas.